At long last, a hint of crispness is in the air. Is there any better time to pull up some chairs and gather around the warmth of a crackling flame? 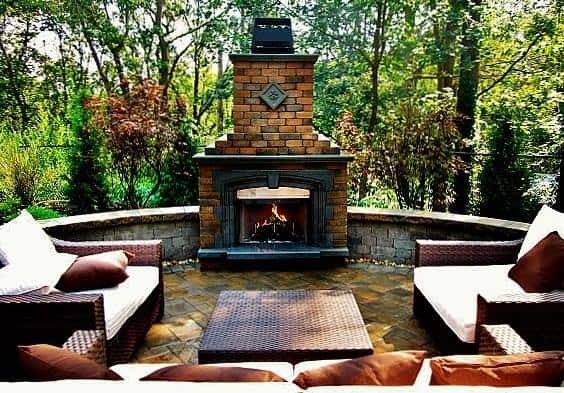 Featured: Cambridge Pavingstones With ArmorTec “Olde English” Fireplace and Wall with Deluxe Cast Stone Surround. Green Island Design – Smithtown, NY Project. This project in Smithtown, NY incorporates our client’s wish list of a large patio and seat walls with outdoor furniture, an outdoor fireplace as a focal point, a play set for the kids, a large expansive lawn area, and a natural retaining wall with colorful plantings.